Emigration, Plymouth Cattewater (oil painting by Gordon Frickers, (www.frickers.co.uk/art/home-page/) reproduced with his kind permission). 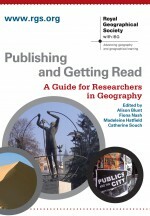 Many different forms of representation have provided inspiration to geographers: works of literature, art, photography, political analysis, tutorials and journal articles, to name a few. Recently, I had the opportunity to view some paintings produced by marine artist Gordon Frickers, which provide detailed insight on geographies of the modern and ancient marine world. Frickers’ paintings are underpinned by comprehensive research of written texts, photographs and objects to produce a visual portrait that is as accurate as possible. 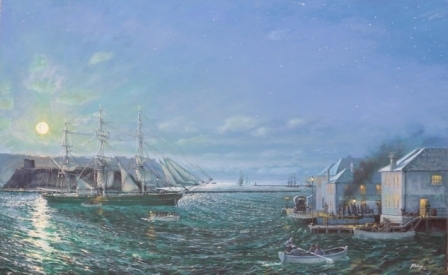 One of his scenes Emigration, Plymouth Cattewater, is an illustration of emigrants departing Plymouth in the 19th century¹. This particular painting reveals a largely forgotten business at a time of significant historical migration, and invites the viewer’s curiosity. It seems clear that geographers cannot understand the world without paying attention to such visual forms of representation. In 2009, the RGS-IBG hosted an exhibition: Hidden Histories Made Visible. Its aim was to bring into full view those people who have been only partially visible in other representations i.e. photographers, Sherpas and cartographers who made expeditions possible but who remain in the shadow of explorers such as Livingstone and Mallory. The exhibition is the subject of Felix Driver’s paper in TIBG. He illustrates the way in which the exhibition challenges assumptions about the history of exploration and geography – in this case celebrating the role of the supporting team rather than the individual explorer. Driver demonstrates how the exhibition’s choreography conveys this message, and reminds us that any representation of the world – even an exhibition – is always partial. For anyone organising an exhibition, this is a useful read. Gordon Frickers’ website provides further information about his paintings and associated research. ¹ The Port of Chester was also a significant point of departure for emigrants, albeit less so than the major ports of London, Liverpool and Plymouth. Frickers’ The Port of Chester (1863), shows this port at its busiest period. This entry was posted in Early View, Society News, Transactions of the Institute of British Geographers and tagged Cultural Geography, design, Economic Geography, Emigration, exhibition, Exploration, Gordon Frickers, hidden histories, Marine art, Plymouth, Royal Geographical Society, Visual representation on September 11, 2012 by fionaferbrache. By Paula Bowles The seventh day of the conference has continued with the key themes of ‘breaking down boundaries’ and interdisciplinarity. Roy Baumeister (Florida State University) began the day with his keynote lecture entitled ‘Human Nature and Culture: What is the Human Mind Designed for?’ By utilising the concepts of evolutionary and cultural psychology, Buameister is able to explore the intrinsic significance culture holds for humanity. Two other papers were also presented today. ‘Text as It Happens: Literary Geography’ by Sheila Hones (University of Tokyo) and Stefan Müller’s (University of Duisburg‐Essen) ‘Equal Representation of Time and Space: Arno Peters’ Universal History.’ These contributions have utilised a wide and diverse range of disciplines including history, cartography, geography and literature. Finally, Devonya Havis’ publishing workshop entitled ‘Teaching with Compass’ offers some interesting ideas as to how best implement technology within the classroom. This entry was posted in Uncategorized and tagged Arno Peters, classroom, Compass, Culture, design, Devonya Havis, history, human nature, literary geography, Mind, Roy Baumeister, Sheila Hones, space, Stefan Müller, teaching, text, time, Wiley-Blackwell on October 29, 2009 by compasseditorial.